Its pretty hard, there are loads of possibilities and counter questions you could ask. How do you know where to start? At this training session, we were introduced to the idea of using issue trees to answer questions. The idea being that you break down a tough question into smaller questions which if answered, will give you the final answer. In reality, for a true issue tree to work correctly, things are a little more complicated. As an example, each section of the tree should be MECE (mutually exclusive, collectively exhaustive) which essentially means that each category of questions should not overlap and be distinct from each other. Furthermore you should find that every category of questions should deal with all possible outcomes fully. I could go into more detail but in the interests of keeping you all with me, lets relate this to a real SEO problem that we have all faced at some point. 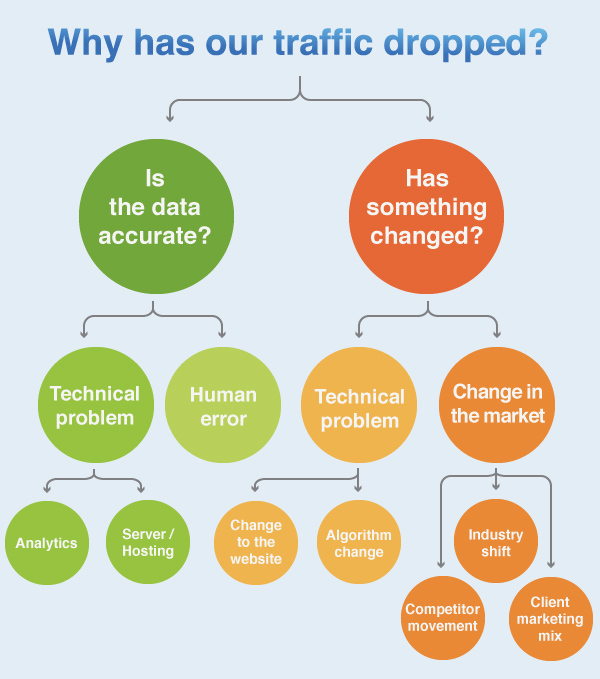 Client Question - Why has my traffic dropped? It is possible to use issue trees and the MECE principles to answer this question. The advantage to using an issue tree is that you can be assured that you have explored all possibilities and now have the right answer for your client. Below is a quick mockup of how an issue tree may look for this question. Caveat - this has been mocked up quickly and I'm not claiming this is 100% accurate. The point of this post isn't to answer this specific question right now, the point is to get you thinking about whats possible and how you can use issue trees in your own SEO campaigns. As I said, this is just for a demo and I'm sure some of you can find other ways to approach the question. But hopefully this gives you an idea of what an issue tree is trying to achieve. To give you more context and make this post as useful as possible, I'm going to go into more detail about these questions and the thinking behind them. I wouldn't laugh at the last one, sometimes it can be that someone is looking at the wrong report or the wrong timeline. As you can see from the issue tree, we cover these possibilities. If its a technical problem, we've led you to two endings. One being that it is an Analytics problem, the other being that its a server / hosting problem. This can be classified a number of ways and there are all sorts of things that could have changed. However fundamentally, it probably comes down to two areas - a technical problem or a change in the market. There are lots of technical things that could have been done to the site which has caused a drop in traffic. Maybe someone has accidentally put rel=canonical on all their pages or even deliberately as Dr Pete once did. Or maybe a the developers implemented a change that made all the content invisible to the search engines. Either way, you need to explore what has been done in order to get to the bottom of it. In this example, our issue tree finishes here but in a real example, it would probably carry on and get a bit more detailed about the type of technical problems that may occur. It can be argued that this should sit under the "Change in the market" category, as it technically isn't a technical problem. However given recent Panda update stuff, it could also be argued that technical changes will be required to fix the issues. Either way, an algorithm change can certainly lead to a drop in traffic. The options under this category are a little harder to pin down. Whilst it is hard to record changes that happen on your own site, it is even harder to monitor those made on other sites. However if you have access to the right data, it is possible to spot industry changes and competitor changes. Is the industry that you operate in slowing down? Is demand for your services growing or dropping? To use an example, if I had a website that sold VHS video players, I wouldn't be surprised if my traffic started to fall as DVD players became more popular and I hadn't adjusted my own website to adapt to the market change. A good way to measure this kind of shift is to use a tool such as Google Insights which can show you demand for a certain set of keywords over a given time period. I'm not a huge advocate of spending loads of time spying on competitors or worrying about what they are up to. I feel the time is best spent building your own business. However you should definitely be automating the gathering of data including their rankings and link building. You can set these to record automatically so the time and resource required is minimal. But when the time comes to take a closer look, you have lots of data to play with and see what they've been up to. As I pointed out earlier, this particular issue tree is not a finished example. But hopefully it has given you some idea as to the possible with the help of issue trees in solving SEO problems.